With Memorial Day around the corner, you’re probably planning which local parades you’ll be attending. And we all know that when kids hear “parade” they also think…candy! We’ve participated in a few parades ourselves and know how important it is to keep the little ones happy. Positioning: Don’t take your chances and position yourself at the end of the parade. You never know how much candy is stock-piled on the floats, and there’s a good chance they’ll be out by the end of the route. Find a good spot up front, and claim it. Children: Also known as, Candy Magnets. Everyone likes to make a child smile, and for that reason kids are much more likely to be tossed handfuls of candy. Be sure to find a nice family-friendly, child-filled spot to claim as your own. Acknowledgement: You’d be surprised what flashing a smile or giving a friendly wave can do. Show your excitement and interest in being there and you’re bound to get acknowledged by the candy tossers. With nice weather on the radar, we hope you’re able to get out and make the most of these summer celebrations. And wish you nothing but candy-filled success. 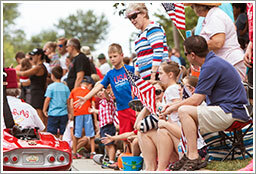 Here is a list of the upcoming Memorial Day Parades in Wisconsin. Take a look and see what’s going on near you!